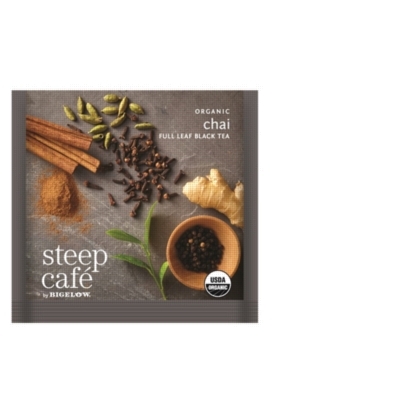 Steep Café Tea by Bigelow's mission was to find the most flavorful organic ginger and spices to marry with their specially selected, mountain grown black tea. Aromatic and rich with ginger, cardamon, and cloves, this beautifully balanced chai blend is equally delightful enjoyed as is, or with milk and honey (or another sweetener), as it is most commonly prepared. Steep a cup to enjoy an authentic chai experience! Steep Café's pyramid bags are compostable. The unique pyramid shape provides greater space for each leaf to expand, releasing its superior characteristics and unique flavor nuances in the manner of loose leaf tea.